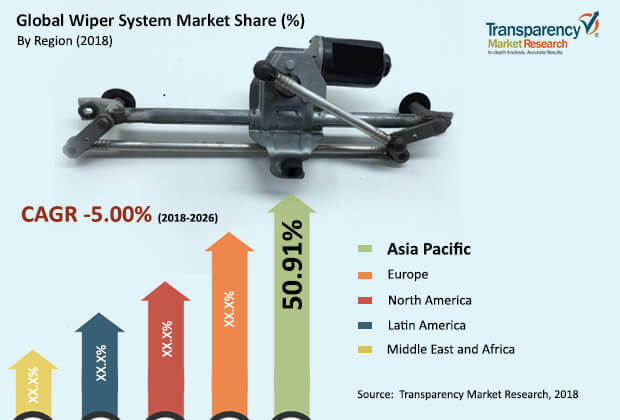 The global wiper system market is estimated to expand at a CAGR of more than 5% between 2018 and 2026, according to a new research report by Transparency Market Research (TMR). Rise in vehicle production owing to the expansion of world economy is boosting the market demand of the wiper systems. Asia Pacific is estimated to lead the global market with a value of US$ 30 Bn. The market is estimated to expand at a steady pace due to the mandatory requirement of the wiper system and no feasible replacement solutions. Rise in demand for SUVs, crossovers, and hatchbacks is estimated to propel the demand for rear wipers, which in turn is expected to drive the wiper systems market in the near future. SUVs accounted for 34% of total vehicle sales in China in 2017. Rising domestic demand has propelled the production of SUVs in China, thereby driving the market in Asia Pacific. Europe being a prominent manufacturers of luxury cars and the region has exhibited great consumer interest in rain sensing technology. Europe has highest penetration of the luxury cars and is the most attractive market for the rain sensing wiper system. High disposable income and demand for driver convenience features are driving the rain sensing technology segment of the market in Europe. Rise in vehicle production in the countries in Rest of Europe, such as the Czech Republic and Slovakia, is further boosting the wiper system market in Europe. The global wiper system market can be classified based on technology, wiper blade type, and component. In terms of technology, the wiper system market can be classified into two segments. The rain-sensing segment is expected to expand at a significant growth rate due to the rising demand for convenience features and luxury. Further development and rise in demand for rain-sensing wiper systems are likely to decrease the price of rain-sensing wiper systems, which in turn is anticipated to boost its penetration in the market. Based on wiper blade type, the wiper system market can be segmented into three wiper blade segments. The beam blade segment accounts for a prominent share of the market, and the trend is expected to continue during the forecast period owing to the effective cleansing of beam blades and their superior aesthetic appearance. In terms of component type, the wiper system can be classified into three prominent components. Windshield wiper and wiper motor are the two leading segments. Rise in the production of SUVs and crossovers has fueled the demand for rear wipers and motors. The usage of two individual wiper motors for the front windshield in order to obtain effective cleaning is gaining in popularity. Utilization of such dual motor technology is anticipated to boost the wiper motor segment of the market. Based on aftermarket component, the market can be classified into three component segments. The windshield wiper segment leads the market, in terms of volume, as the component experiences wear and tear. The necessity of periodic replacement of the windshield wiper is a key driver of the aftermarket industry. In terms of vehicle, the wiper system market can be classified into passenger vehicle and commercial vehicle. In terms of revenue, the passenger vehicle segment dominated the market and is expected to maintain its dominant position in the market by the end of the forecast period. Rise in the production of commercial vehicles in Latin America due to investments by Daimler AG, Ford, and Volvo is expected to boost the wiper system market in the region. Based on region, the global wiper system market can be segment into North America, Europe, Asia Pacific, Latin America, and Middle East & Africa. Key players operating in the global market include Robert Bosch GmbH, DENSO Corporation, Valeo, Federal Mogul Motorparts LLC., HELLA GmbH & Co. KGaA, DOGA SA, Nippon Wiper Blade Co., Ltd., Pilot Automotive, Am Equipment, Mitsuba Corp., B. Hepworth and Company Limited, and Magneti Marelli S.p.A.